Samantha and I were enjoying coffee and donuts at Deputy Donut, the donut shop owned by our friend Emily and Emily's father-in-law, Tom. We were on our coffee breaks, and both of us were wearing our uniforms. Samantha is an Emergency Medical Technician. I'm a police officer in the Fallingbrook Police Department. Samantha craned her head around. Emily was closed in her office with her cat, Dep, who has the most amazing play space in that room and spends her days there. Apparently deciding that Emily couldn't hear her, Samantha leaned forward. "Here it is, almost Valentine's Day," she said, "And none of the three of us can expect a valentine." I put on a fake pout. "We haven't progressed much in the years since junior high, have we, when we were obsessed by boys?" Samantha laughed. "No, we haven't. We're still gossiping about the ones we like." I glanced toward the office. "And Emily's still matchmaking." "And she thinks we don't notice." 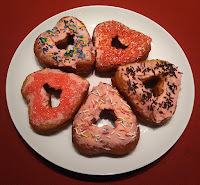 I bit into a heart shaped donut frosted in pink icing and decorated with sprinkles. "Mmmm. This is good. The trouble is, Emily's right. I'd like to be dating our fire chief." "He's a darling, but too tall for me. And I agree with you and Emily--you and Scott belong together. I think it's hilarious that Emily has decided that Brent and I should be a couple. Brent keeps it all inside, but anyone can tell that he's just waiting for Emily to be ready to date again." "Anyone can tell that except Emily. Shh. She's coming back into the dining area." I turned in my seat and held a thumb up. "These donuts and this coffee are perfect, Emily, as always." Smiling, Emily joined us at our table. "You two look like you're up to something," she accused. Samantha put on her most innocent look. "We're just enjoying the wonderful treats at Deputy Donut." Emily half-closed her eyes. "Come on, I've known you two since we were fourteen. You're talking about men." I set my donut down on my plate. "And Valentine's Day," I confessed. Emily stood up. "Maybe next year . . . Hey, you two, what's so funny?" 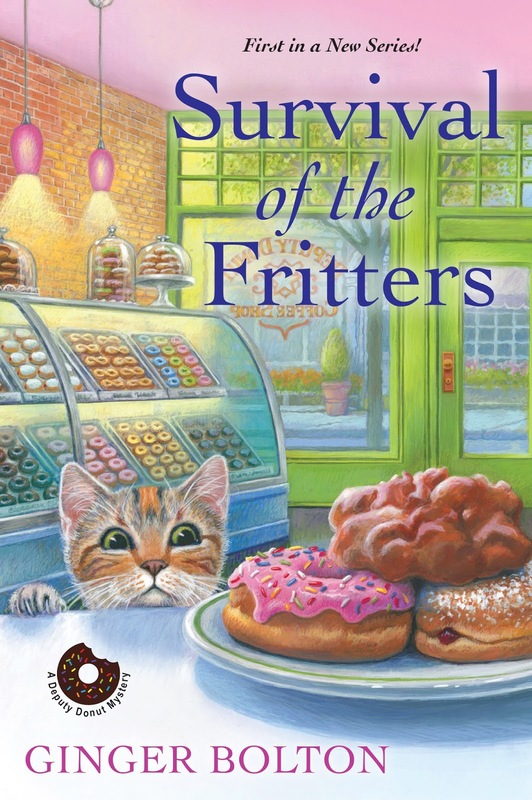 You can read more about Emily and how she and her friends try to solve a murder in Survival of the Fritters, on bookstore shelves now. I like them already! I have the book reserved in the library. Once it comes in, I should get to know the friends better! Thank you, Jane. Aren't libraries wonderful? 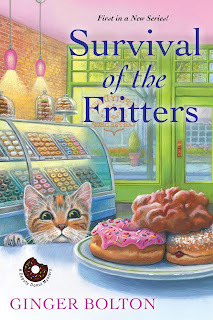 This is the book I'm reading today. Excited to get started. I hope you enjoy it. I had fun writing it. I really need to buy a copy of this one! It sounds excellent! Looking forward to reading it. Thank you. I'm so in the mood for donuts. Can't decide whether to go by a copy or put it in my kindle. Decisions, decisions!